THE NUTCRACKER AND THE FOUR REALMS. (DVD Artwork). ©Disney. Disney’s “The Nutcracker and the Four Realms,” inspired by E.T.A. Hoffmann’s classic tale and Pyotr Ilyich Tchaikovsky’s beloved ballet “The Nutcracker,” carried audiences along with 14-year-old Clara (Mackenzie Foy) to a magical, mysterious world with performances by American Ballet Theatre’s Misty Copeland, and more. The musical fantasy arrives home instantly with never-before seen extras and deleted scenes on Digital and Movies Anywhere, and on 4K Ultra HD, Blu-ray and DVD Tuesday Jan. 29. Bonus features include a discussion with ABT’s Misty Copeland about her role as the enchanting Ballerina Princess, her personal history with “The “Nutcracker” ballet, and her inspirational and historic rise within the world of dance. Extras take viewers on the set of “The Nutcracker and the Four Realms” to meet both new and reimagined characters, and discover how the Land of Sweets, Land of Snowflakes, Land of Flowers and mysterious Fourth Realm were created to such dazzling effect. Deleted scenes provide a look at magical moments that didn’t make the final version of the movie. In “The Nutcracker and the Four Realms,” Clara travels along a golden thread, presented at Drosselmeyer’s (Morgan Freeman) annual party, eagerly searching for a one-of-a-kind key that will unlock a music box that holds a priceless gift. 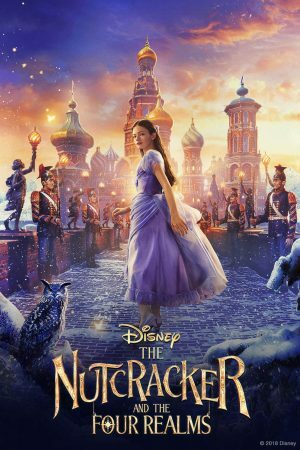 When she enters a mysterious parallel world, Clara encounters a Nutcracker soldier named Phillip (Jayden Fowora-Knight, “Ready Player One”), a gang of mice and three Realm regents, including the Sugar Plum Fairy (Keira Knightley, “Pirates of the Caribbean” films). Ultimately, she must brave the ominous Fourth Realm, home to the tyrant Mother Ginger (Helen Mirren, “The Queen”), to retrieve the key and return harmony to the unstable world. The film will be packaged and released in several different formats, giving families the flexibility to watch it on a variety of different devices. Viewers can instantly watch the film in Digital UHD, HD and SD, and bring home a physical copy of the film as the Ultimate Collector’s Edition (4K UHD, Blu-ray and Digital Code), Multi-Screen Edition (Blu-ray, DVD and Digital Code) or a single DVD. “Benchwarmers 2: Breaking Balls” is based on Revolution Studios’ wildly successful 2006 comedy, “The Benchwarmers.” Filled with side-splitting antics, “Benchwarmers 2: Breaking Balls” will be available on DVD, Digital and On Demand Tuesday Jan. 29. Ben McGrath (Chris Klein) had major league potential playing professional baseball, but his hopes to play ball literally get crushed. Down on his luck, Ben gets another swing at redemption as a new attorney for Schmood & Associates. His unorthodox boss, Mel (Jon Lovitz), convinces him to manage their eclectic softball team full of misfits and strikeouts. Together, they must muster the spirit to rally and win it all. Bringing together an incredible cast of characters to the franchise, Benchwarmers 2: Breaking Balls welcomes the return of Jon Lovitz (“The Ridiculous 6,” “A League of Their Own”) reprising his role as “Mel” and stars Chris Klein (“American Pie” franchise, “Just Friends”), Lochlyn Munro (“Riverdale,” “White Chicks”) and Chelsey Reist (“The 100,” “Dark Harvest”). Jon Rosenbaum (“Cop and Half: New Recruit) directed the comedy from a script by Stephen Mazur (“Liar, Liar”). “Hunter Killer” arrives on 4K Ultra HD Combo Pack (plus Blu-ray and Digital), Blu-ray Combo Pack (plus DVD and Digital), DVD, and On Demand Tuesday Jan. 29 from Summit Premiere, a Lionsgate company. It also is available now on Digital. The film is a high-stakes action-thriller, taking audiences deep beneath the Arctic Ocean to sneak through enemy waters and stop WWIII from becoming a reality. It features an all-star cast including Gerard Butler (“Olympus Has Fallen,” “300,”), Oscarwinners Gary Oldman (“Darkest Hour”) and Common (“Selma”), along with Linda Cardellini (“Mad Men”), and Toby Stephens (“Die Another Day,” “The Machine”). Deep under the Arctic Ocean, American submarine Captain Joe Glass (Butler) is on the hunt for a U.S. sub in distress when he uncovers a secret Russian coup threatening to dismantle the world order. With crew and country on the line, Captain Glass must now assemble an elite group of Navy SEALs to rescue the kidnapped Russian president and sneak through enemy waters to stop WWIII. Take a deep dive into the making of the film with the “Surface Tension: Declassifying Hunter Killer” two-part featurette, as well as an audio commentary with director Donovan Marsh. Experience four times the resolution of full HD with the 4K Ultra HDCombo Pack, which includes Dolby Vision HDR. The 4K Ultra HD Combo Pack and Blu-ray also feature Dolby Atmos audio mixed specifically for the home, to place and move audio anywhere in the room, including overhead. The “Hunter Killer” 4K Ultra HD Combo Pack, Blu-ray Combo Pack, and DVDwill be available for the suggested retail price (SRP) of $42.99, $39.99 and $29.95, respectively. Sometimes friends will take you straight to hell when “Blood Brother” arrives on Blu-ray (plus Digital), DVD, and Digital Tuesday Jan. 29 from Lionsgate. This film is currently available On Demand. Starring music artist Trey Songz (“Baggage Claim,” “Texas Chainsaw 3D”), Jack Kesy (“Deadpool 2,” “The Strain”), China Anne McClain (“Grown Ups,” “Black Lightning”), WWE superstar Ron “R-Truth” Killings, and top-selling music artist Fetty Wap, the film is an action-packed crime thriller about an ex-con hell-bent on revenge and his former friend who’s out to stop him. “Blood Brother” Blu-ray and DVD will be available for $21.99 (SRP) and $19.98 (SRP), respectively. Small-town pizza delivery is about to get dangerous when “Slice” arrives on DVD Tuesday Jan. 29 from Lionsgate. Grammy winner Chance the Rapper makes his acting debut alongside Primetime Emmy nominee Zazie Beetz (“Atlanta”) in a horror-comedy from Austin Vesely (longtime director of Chance the Rapper’s music videos), who makes his directorial debut. The “Slice” DVD will be available for $19.98 (SRP). Extras include deleted scenes and a commentary with director Vesely, producer Elijah Alvarado and actor Paul Scheer (“The Disaster Artist,” “The League”). AMC’s science fiction thriller and BAFTA Award nominee for Best Drama Series, “Humans 3.0,” the uncut UK edition, makes its DVD and Blu-ray debut Tuesday Jan. 29, from Acorn, an RLJE Entertainment brand. In the near future, humanoid servants called Synthetics have been created to help busy families simplify their lives. “Humans 3.0” explores the intersection of man and machine. Aired on AMC last June, the “Humans 3.0” comes in a three-disc DVD and two-disc Blu-ray sets each feature eight episodes, plus bonus behind-the-scenes featurettes ($39.99 SRP each, Amazon.com). The series is based on the award-winning Swedish science fiction drama “Real Humans.” One year after synths around the globe gained consciousness, human distrust of synths is at an all-time high, and both populations struggle to cope with the fallout. Human lawyer Laura (Katherine Parkinson, “Doc Martin,” “The IT Crowd”) fights for synth rights at a high-profile government commission, while Mia (Gemma Chan, “Crazy Rich Asians”) and Max (Ivanno Jeremiah, “Black Mirror”) run a settlement for sentient synths. But Max is torn between his new role as leader and helping his friend, human-synth hybrid Leo (Colin Morgan, “The Fall”). When a bomb blast at a synth-friendly bar inflames already high tensions, Niska (Emily Berrington, “24: Live Another Day”) searches for the perpetrator, and what she finds will have monumental consequences for humans and synths alike. The series also stars Mark Bonnar (“Shetland,” “Catastrophe”), Tom Goodman-Hill (“The Secret Agent,” “Mr. Selfridge”), Ukweli Roach (“Blindspot”) and Sam Palladio (“Nashville”). The holiday season may be over with, but Front Row Features wants to help you start a new holiday tradition with your family. That’s why we’re giving away a digital copy of Disney’s “The Nutcracker and The Four Realms” to five lucky readers so they can watch the breathtaking film over and over again each holiday season with their family. To enter the contest, simply email socalmovieeditor@aol.com by Feb. 4 for your chance to win. Good luck!